A refreshing surprise. I’m usually not a fan of overtly inspirational films, but I was often moved by The Way and definitely recommend it. The spot-on casting and appealing characters should appeal to a broad audience. Unlike most films with spiritual subtexts, The Way speaks to audiences of all faiths and no faith. There is something for everyone searching to find meaning in life after debilitating setbacks and loss. The “road” theme is utilized to good effect; and while the Don Quixote/Sancho Panza/Dulcinea reference becomes apparent early on, it injects some much-needed levity. The engaging actors should generate interest in this offbeat subject and may inspire audience members to follow “the way” (The Camino) as well. 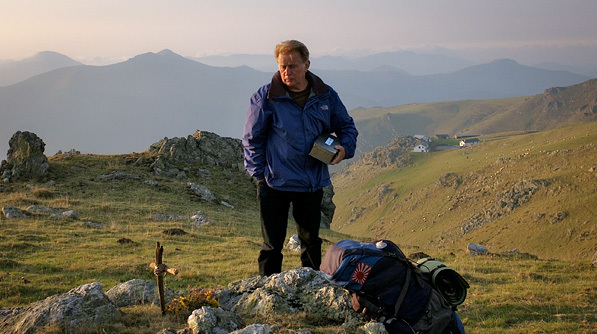 The characters’ attachment to the grieving dad protagonist (Martin Sheen), despite his arrogance and insensitivity, is touching and sustains interest in their journey and self-actualization. The debunking of gypsy stereotypes, while perhaps a bit forced, provides food for thought and a new look at gypsy culture today. The same can be said for the Catholic priest who tackles the journey in unorthodox garb. This entry was posted in Film and tagged Bereavement, Emilio Estevez, Family Relationships, Martin Sheen, Spiritual Issues. Bookmark the permalink.